Redland City Council is hosting its next disaster preparedness Street Speak event at Mount Cotton on Saturday 21 October. 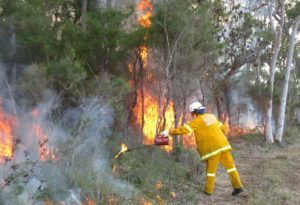 Redland City Mayor and Local Disaster Management Group chair Karen Williams said the Street Speak series aimed to provide practical advice and take-home information for residents to be prepared for the coming storm and bushfire season. “We encourage everyone to come along to the Street Speak from 8am – 12.30pm on Saturday 21 October outside the Mount Cotton IGA and make sure they are prepared for all weather scenarios heading into summer,” Cr Williams said. “The Street Speak series is a great way for our City’s emergency services personnel and volunteers to get out and meet our residents and provide essential information. “Australia is famous for its droughts and flooding rains, and we need to be prepared for whatever Mother Nature may throw at us. “The extremely dry conditions we have been experiencing may continue, bringing heightened fire risks. Division 6 Councillor Julie Talty said she particularly encouraged Mount Cotton, Sheldon and Redland Bay residents to take advantage of a local opportunity to discuss their storm and bushfire preparedness. “The Street Speak series happen around our City, and 21 October is a chance for Mount Cotton and Sheldon residents to easily access practical advice,” Cr Talty said. “I also encourage any residents who missed the Redland Bay Street Speak last month to come to Mount Cotton. “People can ask questions about how to best prepare their own properties and take away a copy of the Redland City Disaster Management Plan, with suburb-specific information. Can’t make it to a Street Speak? Visit Redlands Disaster Plan, Council’s dedicated disaster management website. Posted in Disaster management, Events and tagged .